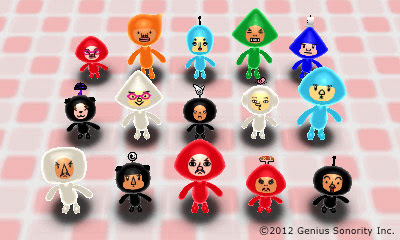 If the name Denpa Ningen RPG doesn't ring a bell, how about "that previously Japan-only eShop RPG that features characters who look part Teletubby, part Tingle, part Pikmin, part Mr. Driller and part Mii"? Note how I described it as a "previously Japan-only" eShop RPG. That's because this wacky, Genius Sonority-developed title is on its way to the North American eShop, according to at least one source. No word on when it'll arrive, but the same source suggests a Denpa Ningen RPG demo will hit the eShop in advance of the full game's release, so we're sure to get at least a bit of warning before we're forced to hand over our hard-earned dough. Still not convinced that the announcement above constitutes good news? Check out this trailer for the Japanese version of the game. Ha! Thanks for pointing that out, warp. Just fixed the header. Doh! This game might just get me into RPG:s :D Seriously, I am so hoping it will reach Europe as well. That would be great, Linnea! And, yes, let's hope it's released in all territories, not just in the US. I have no idea what this is but its too cute to ignore! As far as I understand it, at the start of Denpa Ningen (and possible throughout?) you collect the creatures/characters shown in the screenshot in this post via some sort of AR mini-game. After that, you take them into dungeons and battle foes in order to ... well, I'm not sure. I think you're supposed to rescue someone, though, a la your typical RPG. Oh, and based on what I've read elsewhere, each character's antenna gives a hint as to what its main 'power' is -- as in, one signifies that the character uses fire, another signifies ice, another cure, etc. Hm. My comment never showed up. Weird. Umm...I said something to the effect of "Now I'm curious what the original title said!" And BTW, I checked out that first post on this game, and I'm way excited to see it! I'm glad we're getting such a creative game over here! Me, too, Justin! My only fear is that the site that originally posted the news -- Siliconera -- seems to have pulled down the article. Hopefully that means they just jumped the gun and not that the news was wrong?